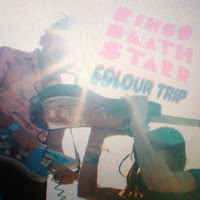 JP's Music Blog: CD Review: Ringo Deathstar Are On A "Colour Trip"
CD Review: Ringo Deathstar Are On A "Colour Trip"
Texas trio Ringo Deathstarr released their newest album "Colour Trip" back in March on Sonic Unyon Records. The band's popularity has been growing by performing with the likes of The Ravonettes, The Trail of the Dead, The Dandy Warhols and others. Their loud fuzz guitars, up-tempo drumming and pop lyrics is a wake-up call for alternative music. The band combines all these elements in the album's opening track "Imagine Hearts," but Ringo Deathstarr really take-off on "Weekend Dudes." Their buzz-like sound make you take notice, while their lyrics are hard to follow at times, but demands you to concentrate more on the music being produced. The band's playful lyrics on "Chloe" make this one of the more mainstream songs on this album. The modern, grunge rock of the mid-nineties comes shining through on "Day Dreamy." The band dabbles with psychedelic sounds on "So High" with minor success while their true sound returns in the punk-drumming of "Tambourine Girl." The band will be on tour overseas for the month of August. For song samples and album information, please visit the band's myspace page (myspace.com/ringodeathstarr). CD Review: Abbe May Returns With "Desire"
CD Review: Heavy Glow Lets Out A "Midnight Moan"
CD Review: Mana Rocks On "Drama Y Luz"
CD Review: Arpline Show Us Their "Travel Book"